STATUS IN THE EAST: The population of this species is growing rapidly in Greenland and northern Europe. For example, the Greenland population, according to Worden et al ( 2004) increased from 9,000 in 1959 to 54,000 in 2003. There are over 225 records from North America with the earliest being a bird collected at James Bay, Quebec in 1867. Although many records have been dismissed as escaped birds, a pattern of occurrence has emerged in northeastern North America, and most records probably pertain to wild birds. In at least one instance, a record of escaped Barnacle Geese in the state has been proved and vigilance is required when considering records of this species. The known escapes pertain to a family group of six birds that was present in Osterville (Barnstable County) from 18 Jan – 28 Feb 1991. It was assumed that this group was the same known family group from Nova Scotia that disappeared from that area on 8 Jan 1991 after a very hard freeze (American Birds, The Winter Season, 45 (2)). The VAST majority of records hail from the following states: MA, CT, RI, NY, NJ, DE, MD, VA, and NC. This perfectly matches the pattern of occurrence for Greenland Greater White-fronted Goose, although admittedly they become harder to detect as one moves west. But note that White-fronted Geese (and Cackling Geese) are more regular in MA than ME, for example. Records away from the East Coast are few and while they have occurred throughout the country, the concentration in the Northeast is dense (5-10 sightings annually in the past decade). This strongly suggests to me a pattern of natural vagrancy. The majority of records occur between October and December, corresponding with fall migration. Some are found throughout the winter as far north as Massachusetts, and a secondary peak occurs in February-April when geese are northbound. Summer records are quite scarce. The majority of records pertain to adults. I think this is the expected pattern of vagrancy in geese, since prospecting lone adults may wander to pre-migratory staging (or molting) grounds, while hatch-year birds typically migrate in family groups with their parents. Hybrid Barnacle x Richardson’s pairings are known, which I believe is expected if Barnacle Geese wander some during summer and wind up breeding among Richardson’s Geese in the High Arctic and then migrating with them. 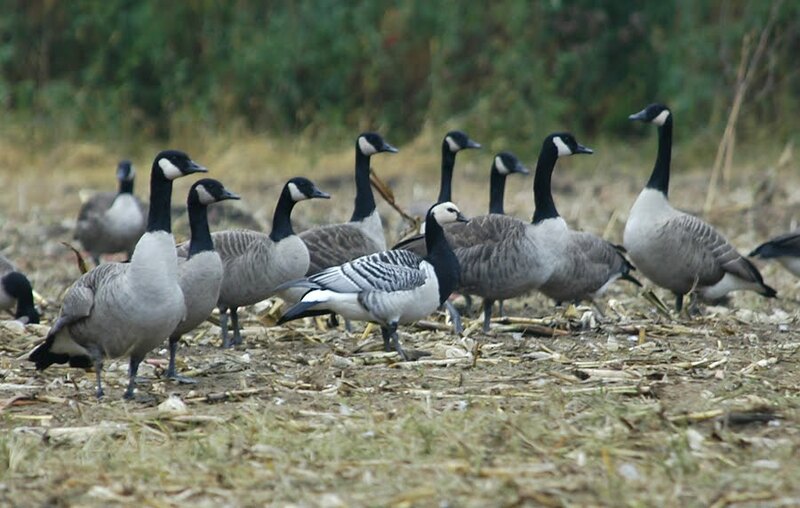 A fair number of Barnacle Goose records have occurred in flocks (or areas) that also have Greenland Greater White-fronted Geese and Cackling Geese. Barnacle Geese occur mostly with migratory Canada Goose flocks (e.g., B. c. canadensis), while relatively few are found with resident “golf course” geese. Known escapees have occurred, but are rare (Osterville birds excepted). Note however that some escapees have pertained to family groups, which I believe are more suspect. I believe the time is gone that Barnacle Geese be considered of “questionable” natural occurrence. The pattern of natural vagrancy is strong and getting ever stronger.